HAPPY NEW YEAR …. and …. 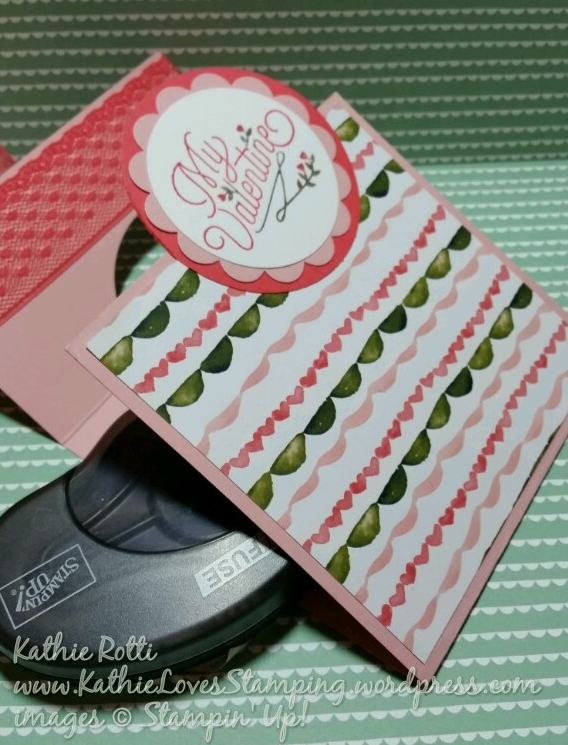 Welcome to the Stampin’ Friends Lots of Love Blog Hop. I hope you enjoy reading my blog. If you arrived from the ever amazing Kirsteen Gill’s Blog (click the button above if you missed her! … or better yet, travel through and you will eventually find her), thank you for coming to visit me! Be sure to click on the “next” button at the end of this post to check out Lynn Streifert’s fabulous contributions. This month we have three amazing Guest Hoppers joining us. Be sure to visit them. You will be glad you did. Well, here are my projects. 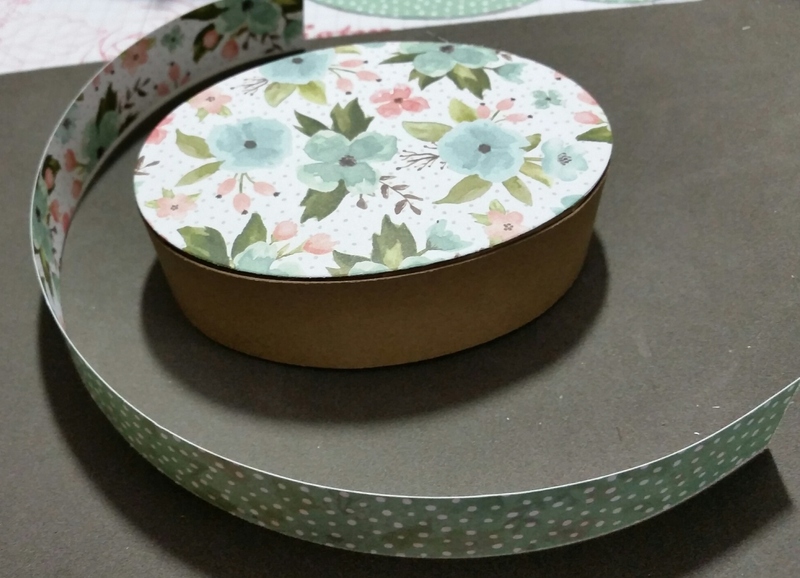 A darling fancy fold card and a set of stunning oval nesting boxes are my creations this month. 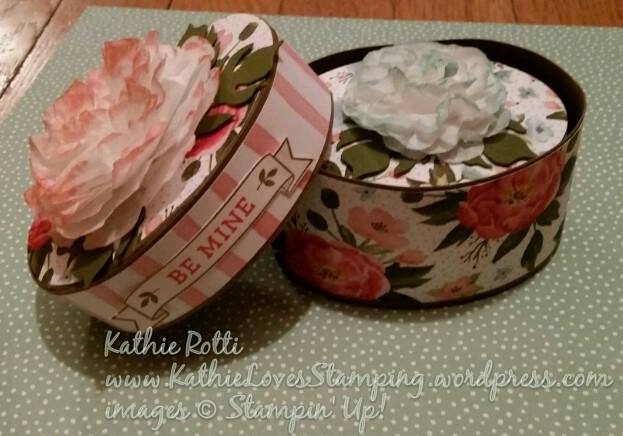 Everything I used is current Stampin’ Up! product. All the stamp sets and designer paper come from the Occasions Catalog. Everything I used is in the supply list at the end of my post. 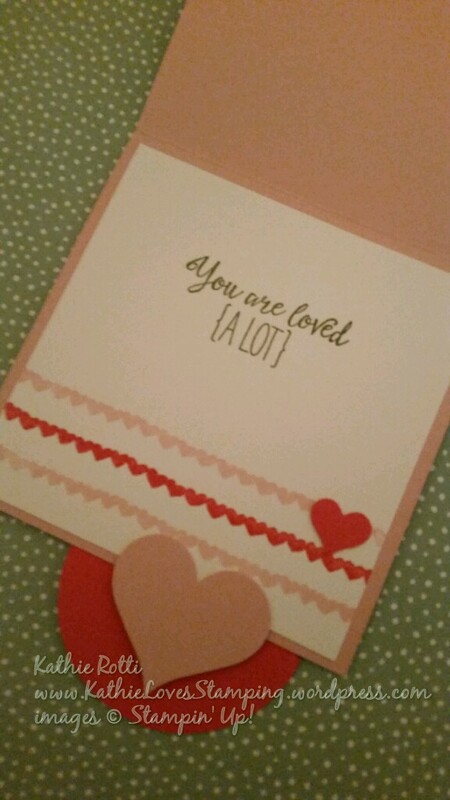 The card is 4-1/4″ x 11″, scored on the long edge at 4-1/4″ and 8-1/2″. After layering on some GORGEOUS Birthday Bouquet Designer Paper, I used a 2-1/2″ circle punch to make the hole. 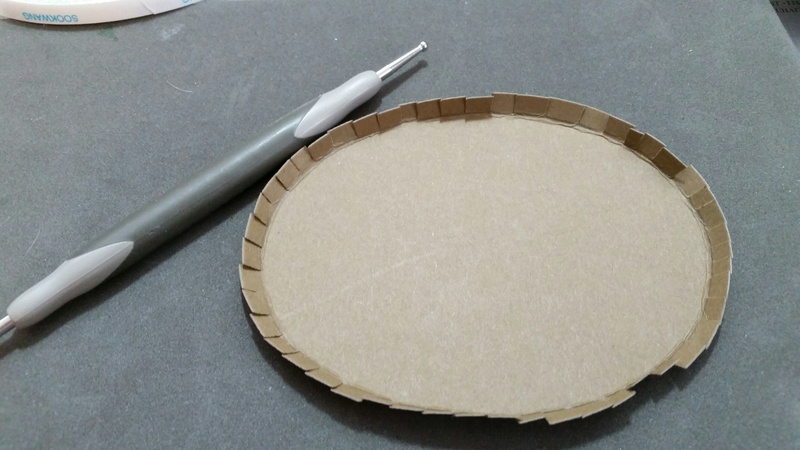 I then punched a 2-1/2″ circle of Watermelon Wonder cardstock and glued that to the lower flap, making sure I had enough clearance to open and close the card smoothly. I layered that with a 2-3/8″ scallop circle from Blushing Bride. 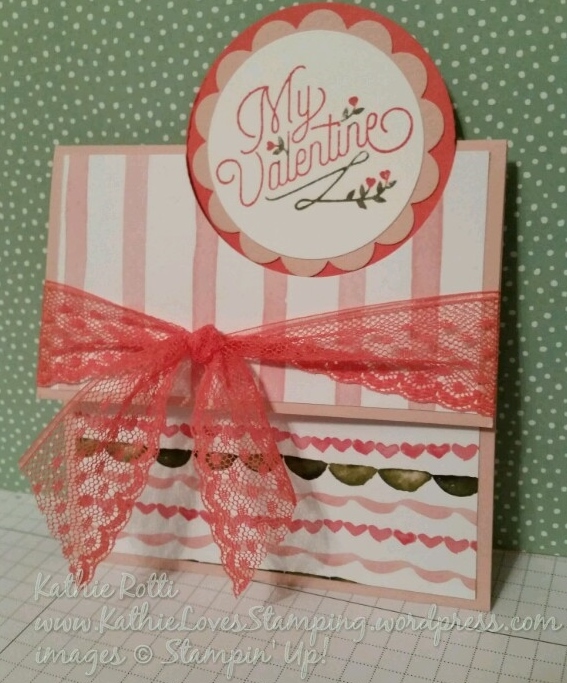 I stamped “My Valentine” (from Bloomin’ Love) on Whisper White using a Watermelon Wonder ink pad. I removed the ink from the leaves and stems with a blender pen and replaced it using a Mossy Meadow Stampin’ Write Marker. I then punched it out with a 2″ punch and adhered it. The inside sentiment (Mossy Meadow) is from “Grateful Bunch” and the line of hearts … stamped in Blushing Bride and Watermelon Wonder … comes from “Birthday Blooms“. (shhhh! a strategically place small heart hides a smear of ink!) The Watermelon Wonder Dotted Lace Trim is simply tied with a knot around the top flap. 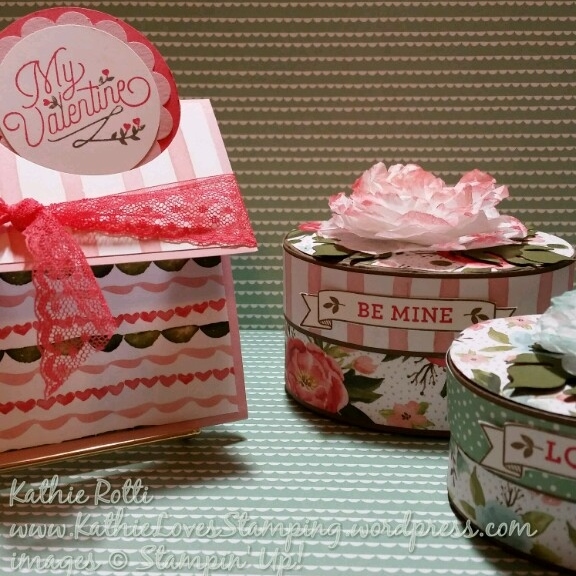 My 3-D project is a set of two oval nesting boxes, PERFECT for a Valentine surprise gift! 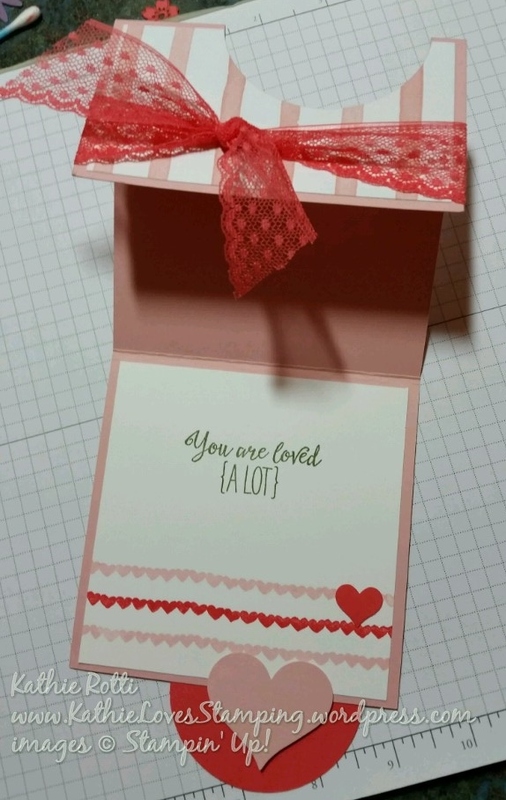 To make the boxes, I used a tutorial from Stamping School. They were pretty easy to assemble. I used oval framelits and Soft Suede Cardstock for the boxes. The large box used # 5 & 6 framelits, the smaller box # 4 & 5. The larger box used 12 x 12 cardstock for the strip for the box side. The side of the larger box is 2″ and the smaller one is 1-1/2″ tall. The lid sides are 1″ and 3/4″, respectively. I used Tear and Tape adhesive to assure a strong bond. Birthday Bouquet Designer Series Paper covers the box. The “Bloomin’ Love” stamp set provides the stamps. 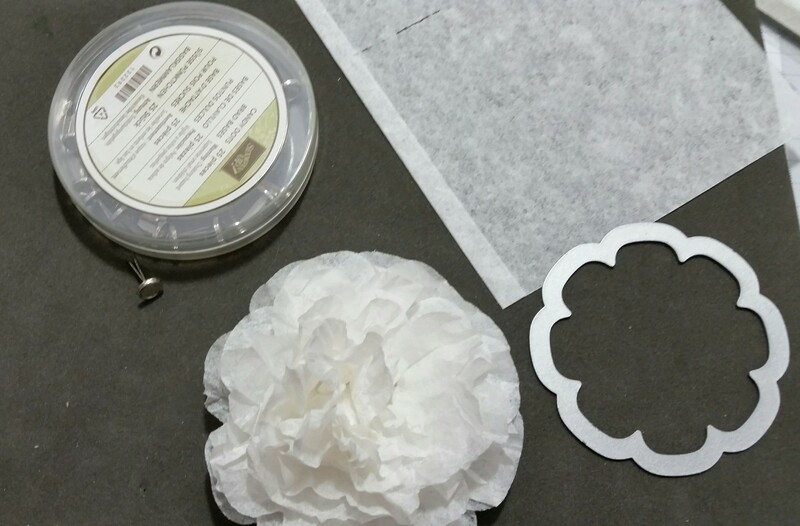 The flower on the top is made from 8 layers of Filter Paper, cut with framelits from the Floral Frames Collection. 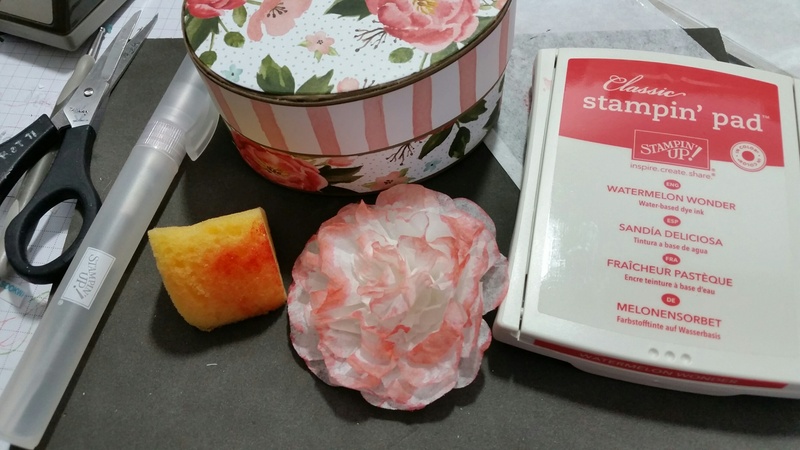 I spritzed a Stampin’ Sponge with water, picked up ink from the ink pad and applied to the edges of the flower. I added a few leaves cut from Botanical Builder Framelit Dies under the flower. I hope you enjoyed my post …. now for prizes. Please comment on each blog using #SFJanHop along with your comment. (Please note … the prizes pictured are NOT what the winner will receive.) 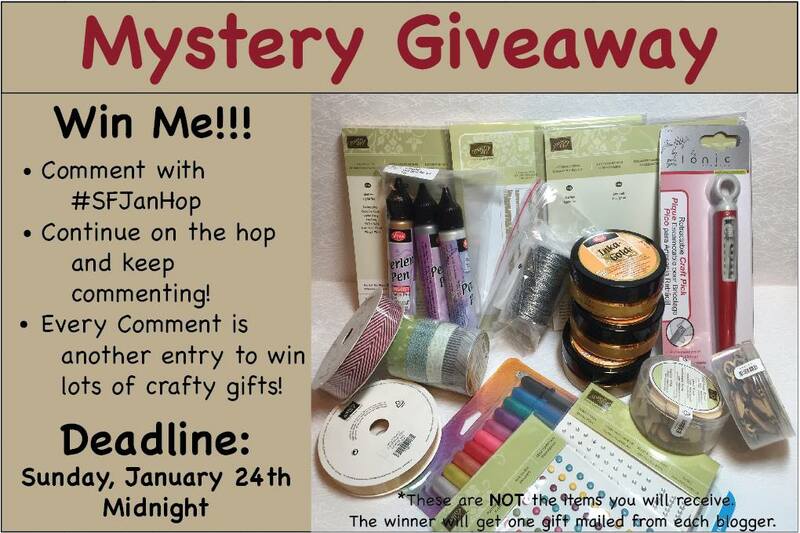 The winner will receive a prize from each of the bloggers in this hop … that’s 15 prizes for ONE lucky winner! Thank you for visiting. Just click the “next” button to continue with the hop. Amazing projects Kathie! Love the box inside a box!. I’m so excited to be on this hop with you. #SFJanHop – so so cute!!!! Great creations! Love them all! #SFJanHop–I love that card design and your boxes are amazing! Wonderful projects – thanks for sharing! Kathie, I loves these projects!! I will need to try them out. TFS!!! #SFJanHop – Love those boxes – beautiful!!! Hi Kathie! I am in AWE of your beautiful boxes- they are just stunning! So thrilled to be in the blog hop with you! #SFJanHop. Adore your card as well as those beautiful boxes! You have the most awesome project E-V-E-R-. These are the most adorable and amazing nesting boxes made!! I LOVE them! You can give them to me next I see you 😀 I also love the card…the extra bit of work, for the multi-colored sentiment really makes this card pop! Beautiful work! #sfjanhop …did I do it right? I love all your creations…. beautiful work! 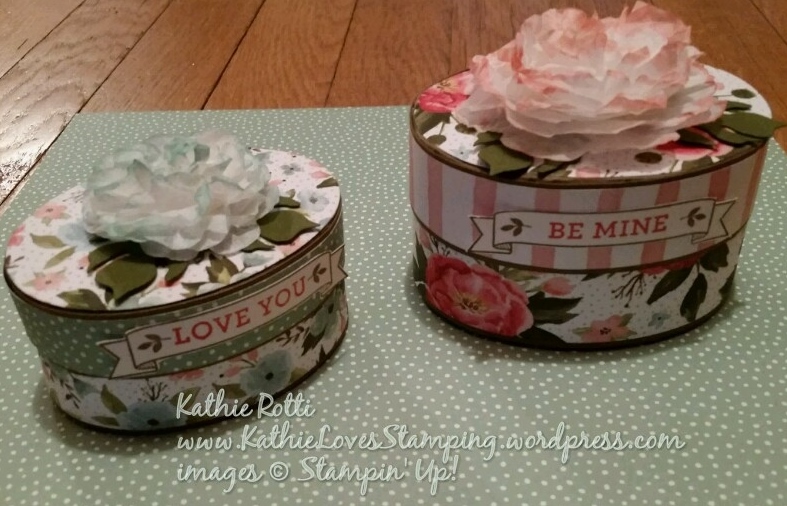 Kathi – Oh my your card and nesting oval boxes. Oh so wonderful! I don’t know which I love more the nesting boxes or the card. Super job! #SFJanHop – I love how you added color to the flowers! Stunning nesting boxes & card! What awesome projects. Love your choice of DSP! #SFJanHop- Thanks for sharing those lovely nested boxes. Can’t wait to try this. #SFJanHop Way to think outside the box!!! I love the paper, too. SO lovely!! I’m going to have to try my hand at theses nesting boxes. I know my sis will be surprised! They were not hard to make. #SFJanHop Love these boxes, Kathie! #SFJanHop Kathie, You always make the most amazing cards and projects. Love them both and love the colors. I’m glad you figured out the commenting!!! Thank you. ❤ ❤ ❤ YOUR BOXES!!!! I LOVE everything you made!!! The boxes are BEAUTIFUL and so is the card…not sure if my box would look so good…lol…great work! You would do just great! 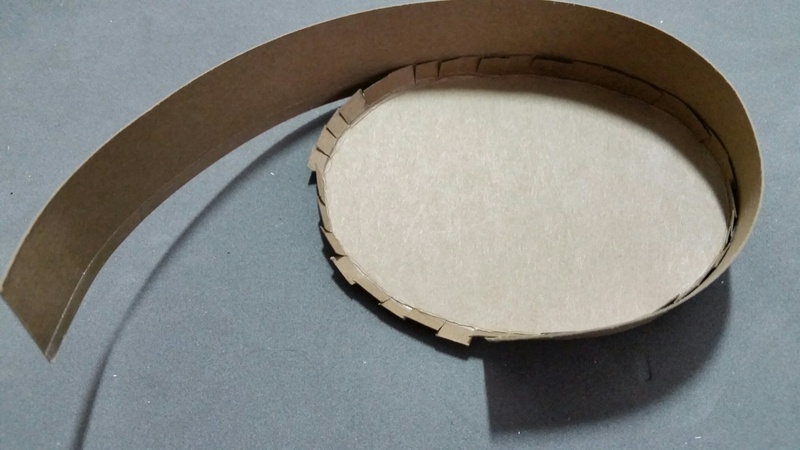 Such a great idea to make oval boxes. Love the pretty paper and flowers! I am making the boxes! They are so stinking cute! That way it gets you out of sending them to me! I am so excited to be hopping with you!